Few movies have a title as iconic as High Noon. Forget the merits of the movie, the title alone evokes strong imagery. Marty McFly quoted the title when setting up his own showdown with Buford, "Don't call me Mad Dog," Tannen in Back To The Future III. All most people have to do is read the title and an image of a lone man standing up against the bad guys for an against the odds showdown comes to mind. Such is the power of High Noon, the movie. The story is incredibly simple - Will Kane has just gotten married and is retiring as marshal of Hadleyville. As he is getting ready to leave town for good with his new bride word comes in that one of the men he's sent to prison has gotten out, and his gang is in town waiting for him to arrive on the noon train. There's going to be a shootout unless Kane leaves town, which he does. But nagging at him is the feeling that he's running, and leaving the town to the mercy of a rather tough and vicious gang. It's more than his conscience will allow, so he turns around and comes back to town, puts his badge back on, and begins to recruit help to stop the group of outlaws. Then a funny thing happens, people that Kane thought he could count on for help turn away from him. Some refuse to help out of fear, some out of selfish ambition, and some out of pragmatism hoping to avoid a shootout which would harm the town's reputation and drive away business investors. How this all unfolds is what makes High Noon as good as it is. The story is pretty much told in real time, and the use of clocks as a de-facto countdown is very effective. Also very effective in the movie is Gary Cooper as Will Kane. Cooper was often a block of wood when it came to his acting (he was usually pretty stiff and often sounded like he was reading his lines, rather than just saying them naturally in character), but in High Noon he actually gave a good performance. He was able to emote not only in how he would deliver his lines, but moreso in his use of facial expressions. For one of the rare times in his career he seemed natural - like he really was the character, rather than, "Gary Cooper, actor," reading the lines of dialogue. The rest of the cast was pretty impressive, too. Grace Kelly - in only her second movie role - played his new bride, and fairly effectively, too (despite their age difference). But more than that, you had a lot of solid character actors giving more than solid performances: Thomas Mitchell, Lloyd Bridges, Lon Chaney Jr, Katy Jurado, Sheb Wooley (later of the TV series, Rawhide), and Lee Van Cleef. It was a fantastic cast, even those in bit parts. And then there's the direction of Fred Zinnemann. Zinnemann and cinematographer Floyd Crosby (father of David Crosby of Crosby, Stills, and Nash) did a fantastic job of creating a visually stunning movie that went away from the usual Western photography. This movie was stark and showed that the town was in a desert area. While some shots are gorgeous, they aren't the beautiful landscape shots that many Westerns used. The long shot looking down a straightaway railroad track towards the hills in the background is stunning, but not very pleasant. And the way that Zinnemann and Crosby shot the town showed style and flair while keeping the images firmly grounded in reality. High Noon is a brilliantly directed Western. The final result of all this is a far above average Western, even if not necessarily one of the very best in the genre (although a valid argument can be made that precisely because of the movie's simplicity it belongs among that top group because of how well they handle the filmmakers handled that simple story). Olive Films delivers another solid release. High Noon has a history of problematic home video releases. One of the previous DVD releases was more than a little soft. This Blu Ray, however, is very, very good. It is much sharper and more detailed than the previous DVD releases, and the contrast is just right. The blacks look dark, but there are still shadows in the image. But within the shadows the detail is still very good (which is often the downfall of many dvd or blu ray releases - poor shadow detail). 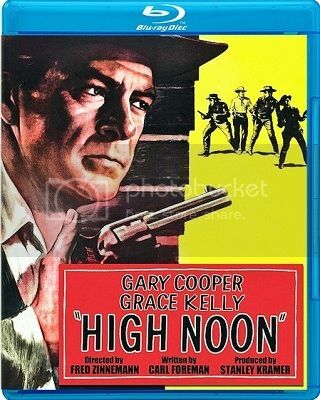 The Olive Films Blu Ray is the definitive release of High Noon to date (and I would assume that their DVD is also quite good).